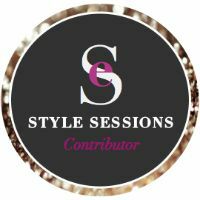 I've been in this 'everything monogrammed' phase since this post. Ever since I purchased that case, I fell in love with the personal touch that a monogram gives. I went on to Etsy to see what other monogram items I might like. As I've said before, monogramming can get really cheesy, really fast, so I knew I wanted something simple and I was going to be really picky about it. I stumbled across Home Twedt Home, an Etsy shop that does a lot of personalized items. 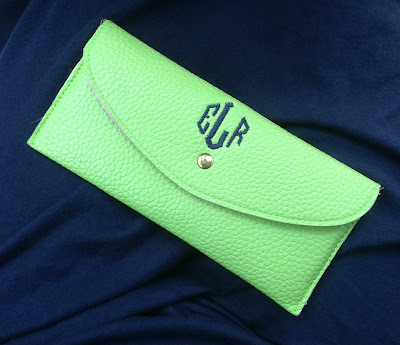 I happened to be on the lookout for a wallet, so when I saw the monogram clutch-style wallets, I knew it had to get one. I love that this wallet is really slim so I can slip it into the smallest/thinnest purse and it even doubles as a clutch. I can carry my iPhone and car key inside and it closes comfortably. You can select both the wallet and thread color. As you know, I've been on this neon kick, so I got the lime wallet with navy thread. The color and quality was really impressive. The above picture is without a filter and you can see how bright and clean/crisp it looks.